Carmel Morris, best known to "Prisoner" fans for her audio CD of series-inspired music (click HERE), also has Prisoneresque writing talents it seems! 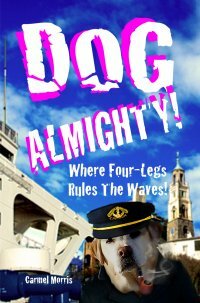 "Dog Almighty" was one of a series of Scholastic books for children, published in Carmel's native Australia, which has now been picked up by Amazon Kindle. "Where Four-Legs Rules the Waves" is a tale which includes many "Prisoner" references as the hapless cast of characters end up in a sinister village. The Kindle edition, which costs only £2.40, is available through THIS LINK by typing "dog almighty morris" in the box, and TUW's Hope House Event Fund will receive 5% of the sale. With thanks to Carmel Morris for this news item.